We've added a new feature to our website. The ability to send your letters via email. Many of you have asked for this feature in the past, so we have now built it into the site. To use it you will need to log into the PC2Paper website and click on the "Email to Letter" tab to setup your account. After you have done so you can then send letters via your favourite email program be it gmail, outlook or the email client on your iPhone, iPad or Samsung Galaxy - any email program will work. 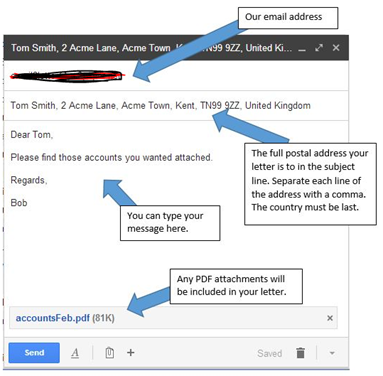 You can choose to type a letter in the body of your email or you can attach a PDF to your email which will also be included as part of the letter. The address of the recipient gets inserted into the subject of the email (please see the image below). Our email to letter gateway will inform you once you have sent your email if it has been accepted. Due to the Thanksgiving holiday in the USA on November 27th & 28th our US printing is closed until Monday, December 1st. Any US based mail will be processed on the next available working day.